The Barn Theatre, Southwick Community Centre. April 28 – May 1, 2, 3, 4 & 5, 1973. BB and FM wrote: “Tonight’s musical play was inspired by the success of our production of Salad Days last season. It may have been a sentimental inspiration that as a company we wished to stage yet another musical. As producers, The Boy Friend has always been a play with which we have both wanted to be associated in some way. “The general feeling in WICK is that musical plays are great fun, although hard work. 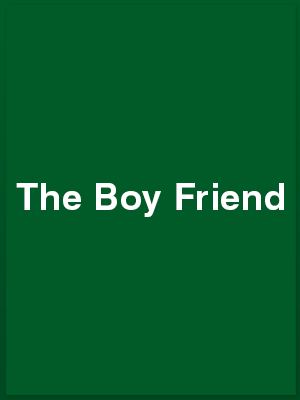 The Boy Friend will be our third full length production with music and it is interesting to reflect on our experience in the song and dance field. After all we are an amateur dramatic company. How did we get around to the idea that we could sing? Well, of course, you can’t divorce music from drama. It is part of the roots of drama as we know it – the chorus of Greek plays – Shakespeare – Feste’s songs in Twelfth Night for instance – the Masques of the Middle Ages and in modern times the development of dance drama with Hair, Godspell and so on …. We acquired a taste for music by putting on two sophisticated revues some ten years ago – Noc Turne and Infra Dig – all good fun but not integrated stuff – just songs and sketches. Next we tried The Hollow Crown on one lovely summer evening when Sheila O’Farrell and Christopher Martin sang some traditional airs. Several years passed be fore we decided to put on Oh! What A Lovely War. This play was hard work but very rewarding. We did an excerpt for the Southwick Festival and the following year launched into the full length production with our dear friend the late Peggy King a musical director. It was a great success and whetted our appetites for more. After the passing of another year, Barrie Bowen decide to offer Salad Days as a production. This was presented in the spring of 1972 and the public loved it. Now here we are again. It is not that we aspire to operatic singing. The voices you can judge yourself, but it is the verve and the team work which we hope you will find is putting the song and dance over. Music is part of drama. We use it to set atmosphere. Sometimes the play itself is music. We recently performed Pinter’s The Collection at the Southwick Festival. Don’t you agree that Pinter uses words and silence as a musical score? It is all about communication – sounds and silence. No need to be bored during the next couple of weeks or so. All sorts of things are going on – starting tonight when the Wick Theatre company opens a run until next Saturday at the Barn Theatre, Southwick, at 7.45 p. m. of Sandy Wilson’s The Boy Friend. Barrie Bowen has directed and Eric Thompson is musical director; Miranda Bowen is choreographer as well as appearing as Maisie, with Roger Job as Bobbie. Also in the production are Sally Bacon as Polly Browne, David Creedon as Tony, Ann Baker, Audrey Laye, Anna Walsh, Douglas Tucker, Dinkie Stapleton and Ronald Bolt are in a speciality tango. Dinkie Stapleton started her career as an acrobatic dancer, graduated to dancing on ice, and was one of the first to introduce acrobatics on ice. Then she appeared at a British Trade Fair in Baghdad on a specially constructed ice rink. Then this wealthy Arab gentleman wanted to buy the rink and Dinkie with it. Fortunately he was persuaded to buy just the rink. Dinkie has travelled the world as an ice-skater and taught the art to King Faisal. Coincidence upon coincidence there is another much travelled ice-skater in The Boy Friend. This is Ann Terry who has recently returned from South Africa, who is credited with starting one of the first ice skating clubs in Brighton, appeared in a film called Holiday on Ice, and has done some professional acting. Present intention is to teach ballroom dancing. And yet a further coincidence, she and Dinkie Stapleton have appeared together professionally. A 6a.m. May Day start and a 9a.m. murder Press conference detracted somewhat from my chance of giving the Wick Players’ production of The Boy Friend the attention it deserved. The switch-off of theatre lighting substituting for the use of curtains almost succeeded in sending me off to sleep, but the gutsy chorus of the girls of Mme Dubonnet’s finishing school soon put paid to any possibility of drifting off into the land of nod. For a group that does not make any pretensions of being a musical society, the one act trailer that I saw on Tuesday evening, showed why the show has proved so popular since it began its short run. There was bags of enthusiasm coming over the footlights and I particularly liked the pert performance put on by Monica Joyce as the little maid Hortense. The programme notes to the Wick Theatre Company presentation of The Boy Friend include “The voices you can judge for yourselves, but it is the verve and the team work which we hope you will find is putting the song and the dance over.” Well, I DID find it. The pace, enthusiasm and sheer bubbling light-heartedness of the whole cast send the whole thing swinging along really happily. The very 1920’s pupils at Madame Dubonnet’s Finishing School near Nice are a sheer joy as played by Miranda Bowen, Ann Baker, Moyra Martin and Helena Drzyzga. Their prospective boy friends, Marcel, Pierre, Alfonse and Bobby Van Husen are equally capably played by Mike Donkin, Neil Shephard, Roy Roberts and Roger Job. Sally Bacon as the poor little rich girl Polly Browne I found, perhaps, a trace colourless and surely someone could have found the poor girl a better wig. David Creedon is Tony, the scion of the aristocracy serving as a messenger boy who falls in love with her and shows himself to have a pleasant singing voice as well as being a very competent actor. Anna Welsh is quite excellent as Madame Dubonnet organising her finishing school in an inspired way. Douglas Tucker and Audrey Laye are Lord Brockhurst, with an eye for the girls, and his Lady who keeps an eye on him. A high spot of the evening is the tango danced by Dinkie Stapleton and Ronald Bolt. Richard Porter designed practical and economical stage settings as well as playing a waiter. Jane Durrance, Jane Smith and Ann Terry complete the cast as guests. Production was by Barrie Bowen and Frances Moulton, with musical direction by Eric Thompson, who, with Lillian Chatfield, provides the music on two pianos, accompanied by Stuart Bartholomew on double bass and David Green as percussionist. I believe all seats are sold for tonight’s final performance at the Barn Theatre, Southwick, but it might be worth while trying your luck.